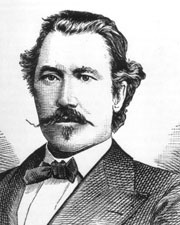 WALSH, Patrick, a Senator from Georgia; born in Ballingarry, County Limerick, Ireland, January 1, 1840; immigrated to the United States in 1852 with his parents, who settled in Charleston, S.C.; became a journeyman printer in 1857; attended night schools, high school, and Georgetown University, Washington, D.C., 1859-1861; returned to Charleston and entered the State military service; moved to Augusta, Ga., in 1862 and for thirty-two years was connected with the press of that city, most of the time as manager and editor of the Augusta Chronicle; treasurer and general manager of the Southern Associated Press; member, city council of Augusta 1870; member, State house of representatives 1872, 1874, 1876; member of the Democratic National Executive Committee for four years; member of the Worlds Columbian Exposition Commission at Chicago in 1893; appointed as a Democrat to the United States Senate to fill the vacancy caused by the death of Alfred H. Colquitt; subsequently elected and served from April 2, 1894, to March 3, 1895; unsuccessful candidate for renomination in 1894; resumed his newspaper interests; mayor of Augusta 1897-1899; died in Augusta, Ga., March 19, 1899; interment in the City Cemetery. Millichamp, Josephine. Senator Patrick Walsh. In Senators From Georgia. pp. 185-88. Huntsville, Ala.: Strode Publishers, 1976.